Formatting is extremely important so your blog is readable. Proper spacing, legible font & font sizing all contribute to the visual ease in which your reader may consume your content. 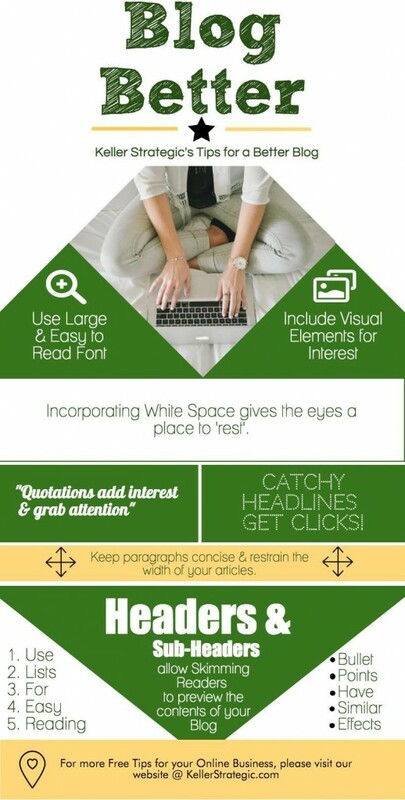 White space gives the reader’s eyes a break and supports the impact of text within your blog. Shorter is better when it comes to web content. Paragraphs should be kept concise. The width of your articles is also important. Set margins so your text isn’t running across the entire page, causing readers to lose their place. Around 80 characters wide is a good place to start. Headers & Sub-Headers visually create blocks of content. They also can be easily read when skimming the page. Lists and Bullet Points are quick & easy to read, too. “Quotes” grab attention and add visual interest. Bold, Italicized and CAPITALIZED text can be used more informally with web than print. Just be careful not to over use them. Most people absorb and retain visual information faster than text. Online content with visual elements also generates up to 94% more views than text alone. So, not only do visual elements make your blog easier to consume, they make it more interesting. Hello! Interested reader are the goal of every blog! Write like you Talk. Keeping your writing “conversational” will help it from getting too stiff and boring. Paint a Picture. Use descriptive words to bring life to your writing and steer your reader’s imagination. Tell a Story. Using stories and anecdotes is a great way to build a personal connection and be memorable. Catchy Headlines get clicks. Headlines are your first impression, so you better make it count with as much personality you can fit in as few words as possible! These How To Tips are super easy to implement and make a big difference for your business’ online presence. If you are interested in improving the content on your own blog, we would love to help out! Call us at (403) 483-9446 or email contactus@kellerstrategic.com.